Like all sports, stock car racing basically comes down to numbers – speed, wins, points, and this year, stage bonus points. As we entered the 13th race of the NASCAR Monster Energy Cup Series, the numbers game had Jimmie Johnson looking to be one of three MENCS drivers to win 11 or more races at a single track. Kyle Busch was looking to lead 59 laps to become the 11th Monster Energy NASCAR Cup Series driver to lead 13,000 or more laps. Yesterday’s NASCAR Xfinity Series race winner Kyle Larson was trying to gain back the points lead from Martin Truex Jr., who holds a five-point lead over Larson. 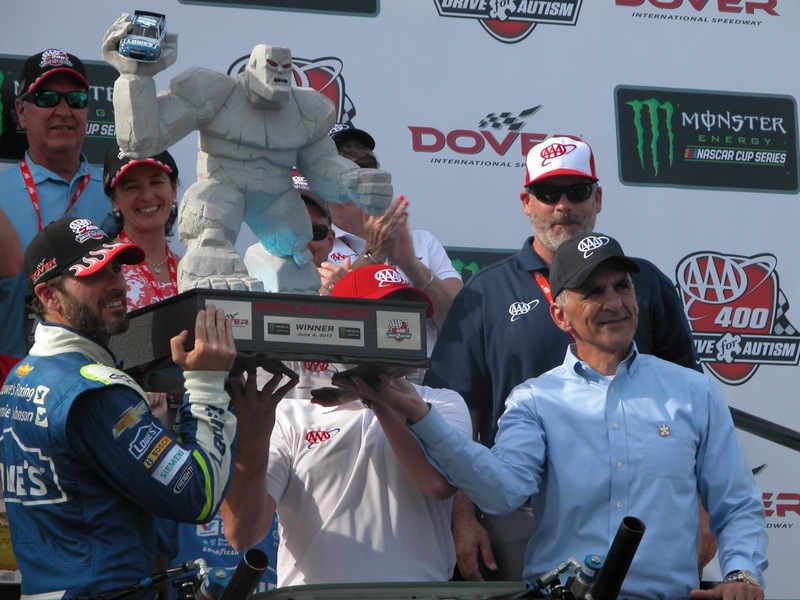 Three hours and 53 minutes and 15 cautions later Jimmie Johnson was the only driver who created his own luck, joining NASCAR Hall of Famers Richard Petty and Darrell Waltrip as the only three Monster Energy NASCAR Cup Series drivers to win 11 or more races at a single track. Petty did it four times (Martinsville 15, North Wilkesboro 15, Richmond 13 and Rockingham 11) while Waltrip did it twice (Bristol 12, Martinsville 11). 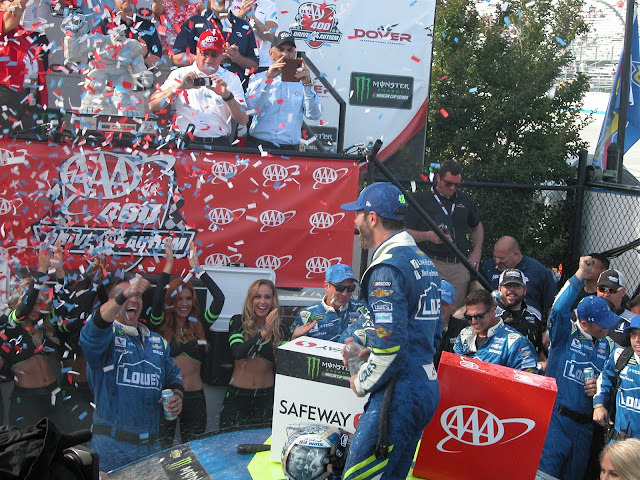 The win marks Johnson’s 22nd top-10 finish in 31 races at Dover International Speedway and his 83rd victory in 556 Monster Energy NASCAR Cup Series races, tying Cale Yarborough on the all-time wins list. Johnson coincidentally was wearing a helmet honoring Yarborough this weekend. This brings his 2017 season total to three wins and five top-10 finishes. Johnson started in the rear of the field due to a gear change. For most drivers that would be unlucky, but not for Johnson. “This is definitely a good one for us. But I am always better passing people than qualifying well,” he said. His crew chief Chad Knaus didn’t credit luck, but his driver’s skills. “Jimmie's ability to adapt is what makes us good here. Drivers need to be willing and able to maneuver around the track." Car owner Rick Hendrick did not chalk it up to luck either. “Look at his record, championships and the races he has won. I think he is one of the greatest in this sport,” Hendrick said. Johnson may have reached another pivotal record in his career, but he already surpassed his dreams 82 races ago. “I only dreamed of winning one race. Eighty-three wins just blows my mind,” he said. Larson, who was the driver to beat all day, came in second and led the most laps with 241. This was Larson’s fifth top-10 finish in seven races at the Monster Mile, and his eighth top-10 finish this season. Martin Truex Jr. led 103 laps, finishing third and scoring his 12th top-10 finish in 23 races at Dover. Truex retained the top spot in the points, gained four points to increase his lead over Larson to nine points. Kyle Busch led only 19 laps, falling 40 circuits short of the 59 he needed to reach 13,000. The Monster Energy NASCAR Cup Series travels to Pocono Raceway next week for the Pocono 400 on Sun., June 11. Tags 2017 NASCAR season X AAA Drive for Autism X Carol D'Agostino X Dover International Speedway X Jimmie Johnson X Kyle Larson X Live Coverage X Martin Truex Jr.